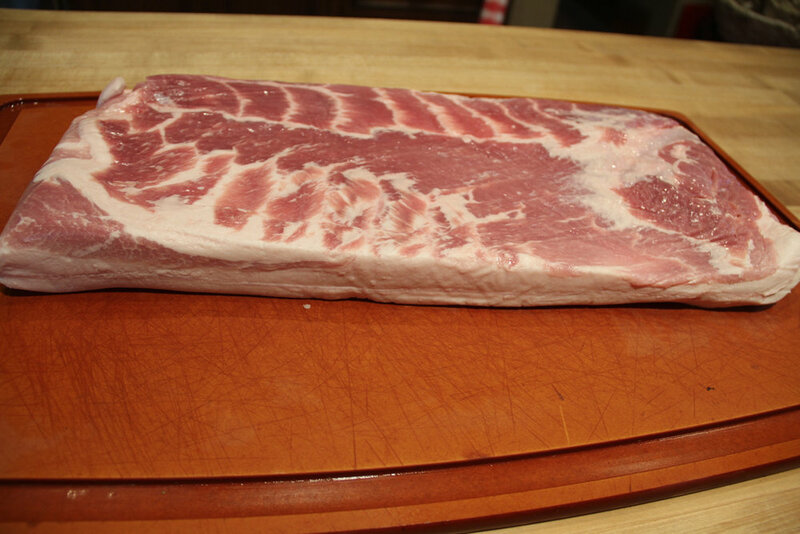 Have you ever seen a pork belly at the store and wanted to cook it, but weren’t sure how? I know the feeling. The other day I knew I was firing my smoker so I decided to pick one up and try it. This recipe is easy and everyone enjoyed the final product. Pork belly is really another word for bacon. Cured bacon requires time to make, and typically involves a product called “pink salt”, which is salt and sodium nitrite. It is actually dyed pink so that it cannot be mistaken for regular salt. Pink salt inhibits bacteria growth, particularly botulism, and so was really useful in times past before refrigeration. I didn’t want to wait for the belly to cure and I wanted something other than bacon for the party I was cooking for. I love brisket “burnt ends” and had heard of other cooks using pork belly for pork “burnt ends”. I decided to cook the belly using all the same techniques I use for my St. Louis style ribs: see here Sunday Ribs from Ross. To prep, the belly, first remove the thickest areas of fat. Hard white fat will never render in the heat. Don’t worry, there is plenty of fat left over. (Fat = flavor). 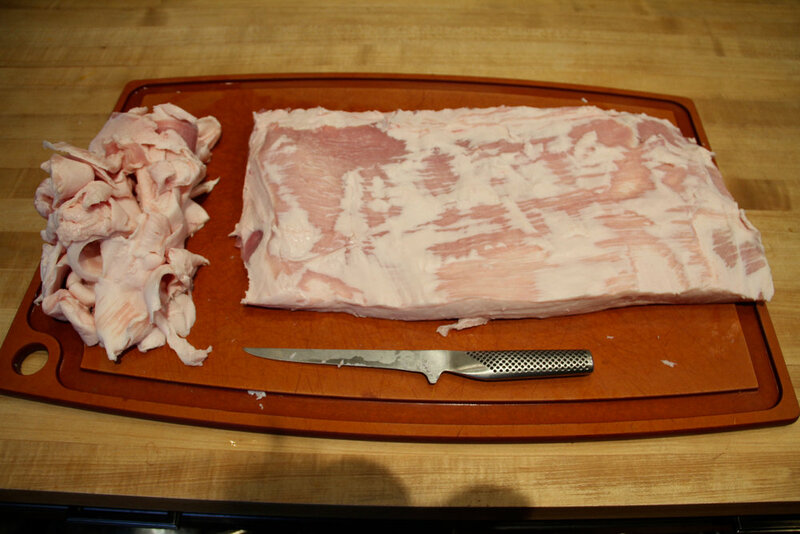 Using a sharp knife, cut the belly into squares of about the same size, an inch or two square. Keeping them the same size will make sure they are all done the same. You don’t want some overdone, some underdone. 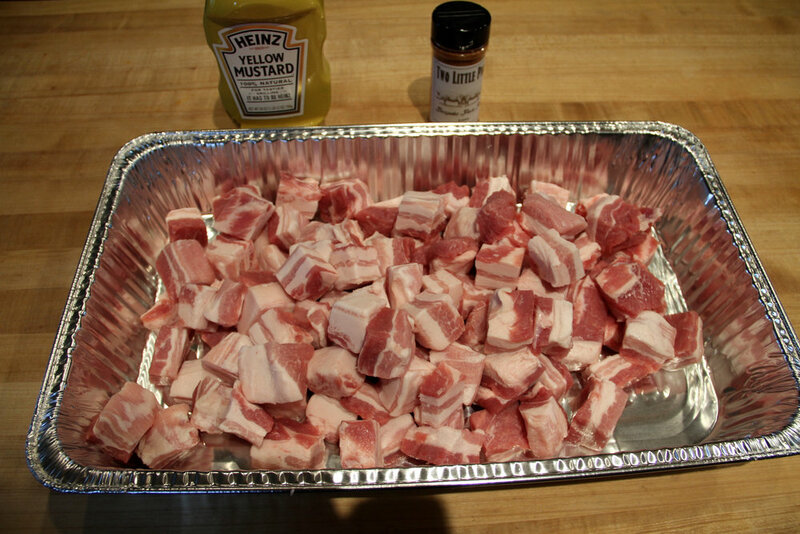 Toss the cubes in mustard and then apply a pork rub. My rub recipe is in the link above, or you can buy a commercial rub at the local grocery. The mustard acts as a glue and will not be detectable when the food is ready. Bring your cooker to about 250 degrees. If using a charcoal grill, add either hickory or apple wood. I used hickory. In a gas grill, use wood chips in a pan or another device to impart smoke flavor. The grates on my smoker were too large for these chunks of meat, so I placed them on the grill from my Kamado Joe. After about 2 hours the cubes should have a nice mahogany color. Remove and place in an aluminum full or half pan. 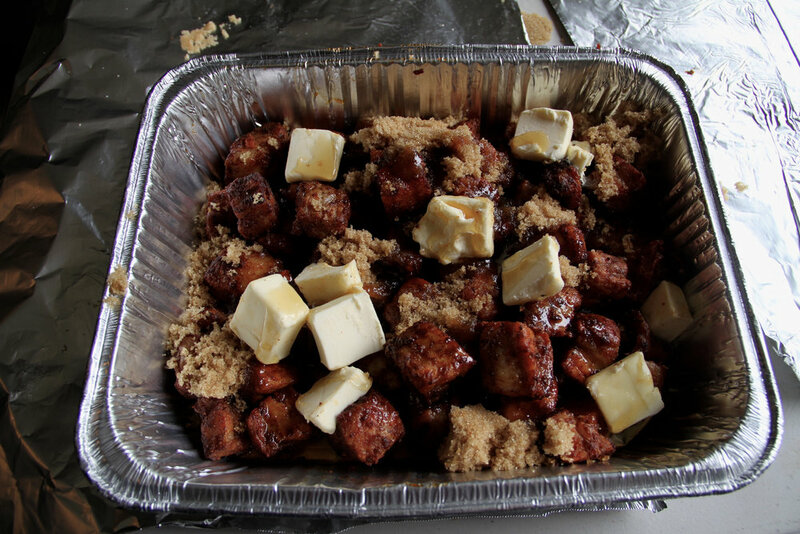 Cover very liberally with brown sugar and honey, and a stick or two of butter, and return to smoker. After an hour and a half or so, these cubes should be ready. Feel free to taste earlier than this to be sure they are tender enough or go longer if they need more time to loosen up. Serve on a tray with toothpicks. Toss the cubes in mustard and liberally apply rub. Smoke for two hours at 250 degrees with either apple or hickory wood. Place in a disposable pan and add honey, sugar, and butter. Return to cooker for another 1.5 hours. Remove from cooker and drain liquid. Serve on a tray with toothpicks. 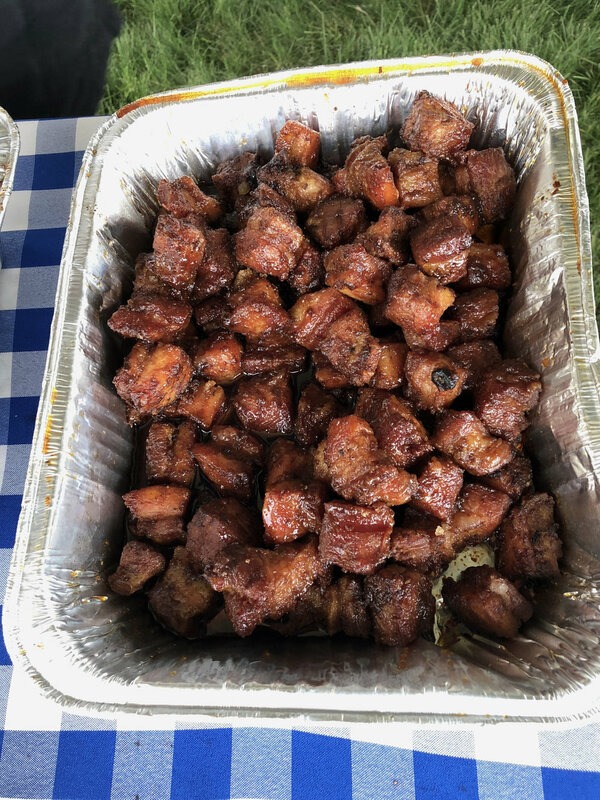 We shared our Candied Pork Belly Cubes with the great folks at the Ronald McDonald House!